NEWBURYPORT — Three months ago, William and Kallie Rossi of Newburyport received just about the worst possible news any parent could hear: their four-month-old daughter Sophie has leukemia. Upon first glance, it would be difficult to tell that the smiling, angelic-looking infant was afflicted with the often fatal blood or bone marrow-related disease. But since that fateful day when doctors at Tufts Medical Center in Boston confirmed that what appeared to be mere bruises on her back was a symptom of leukemia, the Rossis’ world has been turned upside down. Yesterday however, the Rossis received some better news in the form of a $5,000 check from Cops for Kids with Cancer, a Braintree not-for-profit charity run by retired Boston police Superintendent in Chief Robert Flaherty. “We’re very thankful for your organization,” Tony Rossi said. 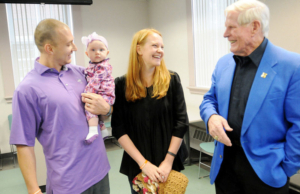 In a brief ceremony yesterday morning inside the Newburyport Police Department, Flaherty handed the $5,000 check to the Rossis just minutes before they were expected to travel to Tufts Medical Center for an appointment. Among the police officers witnessing the ceremony with great grins on their faces were City Marshal Thomas Howard, Sgt. Howard Adams and officers John Gavin, Ronald Senter, Charles Vorderis and Keith Carter. The money will be used to help the Rossis spend as much time with Sophie in the hospital as possible without having to worry as much about mounting bills, job commitments and other responsibilities. Flaherty, who has led Cops for Kids with Cancer since 2008, said his organization is all about helping families focus on their children and not the world around them. “Because the families are devastated,” Flaherty said. In an attempt to weed out those who may fraudulently try to receive money, Flaherty said families are encouraged to visit police stations in their communities first and make their case to one of the officers. Yesterday’s ceremony culminated from just such a visit, when the Rossis heard of Flaherty’s charity and visited the Newburyport police station to advocate for the donation.